Concrete driveway repair can be a time consuming process when the homeowner tries to complete this task on his own. The trouble with “Do it Yourself Concrete Repair” is that most people who have a residential concrete driveway are not aware of the warning signs for impending substantial restoration until it is far too late. By this time, the financial expenditures have often become increasingly costly and the repairs process far too difficult to manage effectively without a professional concrete repair service. In order to save time, money and headaches for the repair, the homeowner should simply keep a close eye on the overall physical condition of the driveway. This does not require an elaborate inspection process, but when a small hairline crack or pothole is noticed, it is best to repair this area immediately. If you wait too long, the problem only intensifies and very often at an alarming rate. Of course there are times when we have just purchased our dream home where everything is perfect except for a few minor required exterior updates. A residential driveway is designed to last for many years, but they will begin to fade and blemish over time due to extremes in temperatures, pollution, harsh weather and heavier vehicle weights. 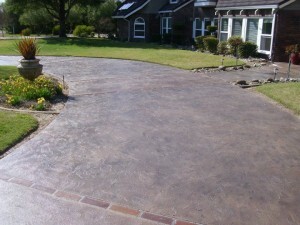 The initial perception might be to rip up the entire driveway and install a brand new system. This can be very expensive, temporarily unsightly, and significantly inconvenient while the process is actually underway. The more effective solution is to first consult with a reputable concrete repair expert. There have been remarkable advancements in this form of construction technology over recent years, and the more professional driveway contractors will be able to provide you with a variety of affordable alternatives. It is not uncommon for the owner of the home to save at least 50% over the cost of replacing the entire surface. Commercial concrete resurfacing will take only a fraction of the time as well. There are some additional aesthetic advantages to hiring a professional. By consulting with a concrete driveway repair expert, you might be able to choose an upgrade in textures or even in color, depending on the current construction of the driveway. These variations may or may not incur increases in cost either, but the professionals will always be willing to discuss your many options prior to beginning the repair.